The robust secure construction of a Concrete Sectional Building makes a perfect Workshop or Shed. A timber building is not strong and secure and needs to be maintained on a regular basis unlike the maintenance-free Concrete Shed or Workshop construction which will give many years of service. These days security is very high on the priority list especially when considering the items that are stored in it. We undertook a project recently to replace a timber shed. Items of value had been stolen from the shed as the timber shed was being easily broken into. A new Concrete Sectional Shed was built and our customers were extremely pleased. 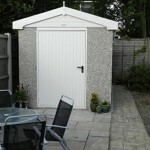 Many thanks for all your help, advice and patience on choosing the right shed for our garden. Thank you once again, I would have no hesitation in recommending your company to family and friends. Huge Choice – The Concrete Sheds and Workshops are available with a choice of roof constructions and many different wall finishes enabling the building to compliment it’s surroundings. Vast range of sizes – Whether it be a Shed for just the recycling or waste bins or a huge Workshop for a local School or Business. The Sheds and Workshops come in a wide choice of sizes and heights. Prefab Concrete Sectional Sheds and Workshops can easily be insulated and lined out creating a very comfortable work space. Dividing walls can be erected inside the building if it needs to be split into sections for multi-uses. Doors and Windows can be installed within any of the four walls. Or maybe just for storage!! Our FREE BROCHURE PACK details all our Prefab Concrete Sheds and Workshops with their prices and options.